Do you work or are you a stay at home mom? I typically mention that I stay at home with my kids and that I used to be an operating room nurse in the Air Force. One thing leads to another, and then it comes up that I’m also working on my MFA in Creative Writing. Those things don’t fit together. These encounters usually leave me feeling like a cluster of fragmented pieces that don’t fit together, a conundrum of opposing and conflicting ambitions and desires. One of my neighbors once responded, “Wow, nursing and creative writing? You must have really strong and opposing parts of your personality.” In between the lines, I have started to wonder if I made a mistake somewhere. Art has always felt like home to me, whether it’s writing a poem or painting a picture. My sketch pads and journals have been a consistent place of refuge and rejuvenation. Growing up, my spirit felt at rest each time I stepped foot in an art studio, amongst the charcoal and paint chips and still life displays. In college, I toyed with the idea of majoring in studio art, but decided to take the more “practical, reliable, sensible, and noble” route. I chose nursing instead. I don’t know if this is a generational or a cultural pressure, or perhaps a bit of both, but it seems that there is some unspoken yet pervading idea that choosing a career in the arts is indulgent, impractical, bohemian, and narcissistic. It’s okay to indulge your creative side every once in while, perhaps as a hobby, but to make it your profession is assuming and irresponsible. In the past, I have felt a sense of shame and embarrassment when I tell people that I am studying poetry. I mean, what kind of respectable human being has time to read and write poetry? Aren’t there more important things to be done in the world? Perhaps I don’t fit into a label, and that might provoke uncomfortable interactions with other people. I am learning to accept this. I have been tempted to replay my decision to become a nurse–to wonder if I should have chosen art instead. And then there are days when I wonder if it’s audacious to think that there’s a place for me in the world of art. At the end of the day, I know it’s a huge freedom and privilege to even have a choice in the matter. Many people don’t. There are things I desperately miss about being a nurse. I miss being a part of the surgical team, working together with others to bring about a life-changing and tangible improvement in someone’s health. It was meaningful work, and even on the bad days, the hard days, the exhausting days, I could walk away feeling good about that. On the other hand, there was always some part of my mind that nursing failed to engage, and over time, this made me feel depleted and burned out. And, so, here I am, back to pursuing art again. I don’t know how my different “selves” will fit together in the end. I do believe that God doesn’t waste anything, and at the end of the day, the so-called “opposing” parts of my personality must be there for a reason. I often like to end my posts with a poem, because, as I mentioned before, there’s a poem for everything. This poet that I want to share with you today has a very prized place in my heart. Can you think of a writer or an artist that has given you permission to be yourself–someone whose work validates who you are and what you love? I can think of many writers like this, but the one I want to share today is Laura Gilpin. Gilpin was a registered nurse and a poet. She is proof that the credentials RN and MFA can be a compatible couple, and she is an inspiration to me. Her book, The Weight of a Soul, has been on my nightstand for months. I take it along with me on errands. I read her poems at stoplights and in waiting rooms. She started out with a BA and MFA and then went back to school to become a nurse. In 1976 she won the Walt Whitman award for her book, The Hocus Pocus of the Universe. She passed away in 2007. 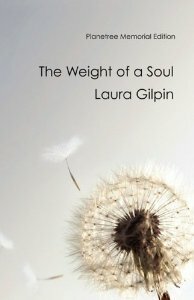 Laura Gilpin reminds me of what can happen when we embrace all of who we are, even the parts that don’t seem to fit together. The next time a new acquaintance makes a remark about how odd and ill-fitting my educational pursuits are, I may just hand them a copy of Gilpin’s book. holds the breath of life, is life giving. Then I wait for the second nurse. which we read aloud in the darkened room. Whose life is held in this bag? between a mother and child.